Yesterday after this photo I posted in my facebook I just knew that there is some people don't know we do have Bear in our country! Yes of coz we do have bear if not why we have the place in Tutong call Bukit Beruang and in out National Museum also got show you that too. Our Bear is not a big bear as what you see in the TV type stand up can reach 7 feet tall... our's one just like a dog size their name is call Sun Bear or Honey Bear!!! Their also can found at India, Bangladesh, Myanmar, Thailand, Peninsular Malaysia, Laos, Cambodia, Vietnam to southern Yunnan Province in China, and on the islands of Sumatra and Borneo. Strange or not... once got bear tropic come out it continue follow one. 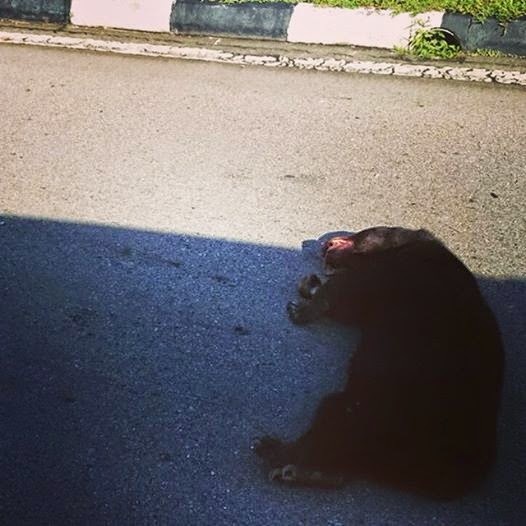 That day in FB got people selling a baby bear then again at Merangang one bear hit by car, follow up this bear also hit by car at Mabohai. This tell me 2 things... one is the bear population not so bad lah still can see many of them here and there, Two is this telling us their land (jungle) getting less and less so now have to come out cari makan with us!! !